Democratic presidential nominee Hillary Clinton addresses the Democratic National Convention via a live video feed from New York during the second night at the Democratic National Convention in Philadelphia, Pennsylvania, U.S. July 26, 2016. Forty-three pictures flashed across a screen at the arena in Philadelphia hosting the Democratic National Convention Tuesday night, each showing one of the men who has served as president of the United States. After President Barack Obama, the image on the screen zoomed out and then shattered into virtual pieces, revealing Hillary Clinton, the first woman to ever be nominated for president by one of the country's major political parties. "It's been a great day and night. What an incredible honor you've given me," Clinton said. She was appearing by video from New York and said Democrats had put the "biggest crack" yet in the so-called glass ceiling preventing women from advancing to higher jobs. Clinton spoke about the significance of the moment to any young girls who were watching. 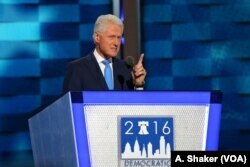 Tuesday's main speaker in support of Clinton was her husband, Bill, who served two terms as the country's president through most of the 1990s. He gave a thoroughly personal account beginning with how they met and going through the history of her work as a lawyer, U.S. senator and secretary of state. "Hillary is uniquely qualified to seize the opportunities and reduce the risk we face, and she is still the best darn change-maker I have ever known," he said. The former president also reached out to groups that have been singled out by Republican nominee Donald Trump. "If you love this country, you're working hard, you're paying taxes, and you're obeying the law and you'd like to become a citizen, you should choose immigration reform over somebody that wants to send you back," Clinton said. "If you are a Muslim and you love America and freedom and you hate terror, stay here and help us win and make a future together." Trump said on Twitter that his party's convention last week was more interesting and criticized Clinton, who gained a reputation as a strong speaker while in office. 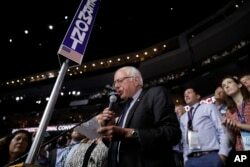 Former Democratic presidential candidate, Sen. Bernie Sanders, I-Vt., stands with the Vermont delegation and asks that Hillary Clinton become the unanimous choice for President of the United States during the second day of the Democratic National Convention. Hillary Clinton officially secured the nomination Tuesday when her rival, Vermont Senator Bernie Sanders, closed the customary roll call of states by asking the convention to select her by acclamation, or unanimous vote. Clinton did the same in 2008 in support of her then-rival, Obama. But the move by Sanders did not go over well with some of his supporters who staunchly oppose Clinton and have not accepted his calls for them to support her. Several hundred of them walked out of the convention hall and staged a sit-in protest. Many had pieces of tape across their mouths with slogans such as "no voice." One held up a sign declaring, "This is what a stolen election looks like." 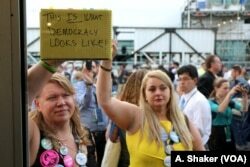 "They're representing that they have no voice in this democracy," one protestor told VOA. "They felt completely shut out. Our democracy has been taken over by corporations." Other Sanders backers signaled they are ready to accept Clinton, especially as an alternative to Trump. "It is a situation where she is the lesser of two evils, and it makes me sick that there is a candidate that I believe in, that I am passionate about, who represents oppressed minorities everywhere and has for his entire life, and I am denied the opportunity to stand behind him because the system was rigged from the beginning," Olivia Love-Hatlestad told VOA. She said "under no circumstances" can Trump be elected president and that it would be an abuse of her privilege not to vote for Clinton. Sanders and his supporters objected to the Democratic Party's use of superdelegates during the nomination process, which allowed party officials to back Clinton and give her the majority of delegates she needed to clinch the nomination. However, even without counting superdelegates, she won more pledged delegates than Sanders. Many Sanders supporters also believe Clinton is too closely linked to Wall Street firms and still favors trade deals that hurt American workers, even as she has disavowed her original support for the 12-nation Trans-Pacific Partnership agreement.